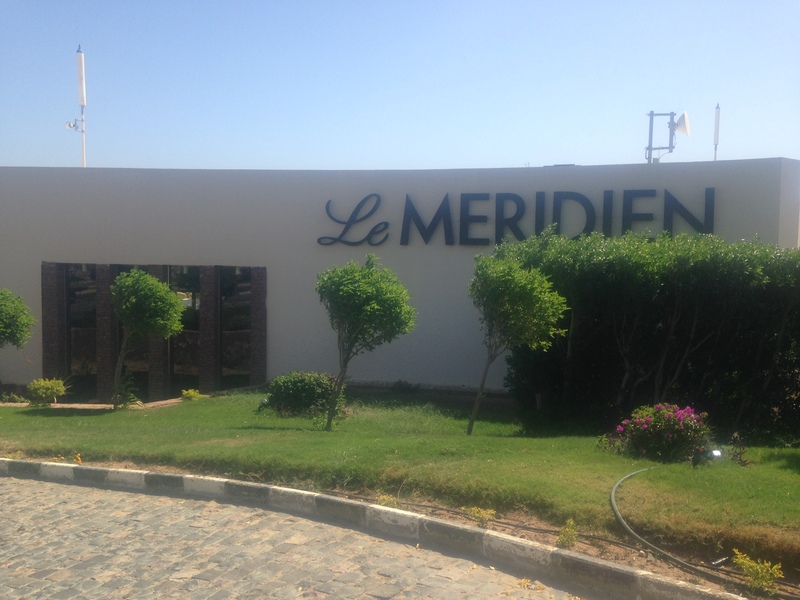 We booked Le Meridien Dahab Resort due to our previous fantastic experiences at Plaza Athenee, A Royal Meridien Hotel, as well as other hotels in the Starwood portfolio, including the Royal Orchid Sheraton Resort and Towers Hotel and St Regis Hotel, all of which are in Thailand. 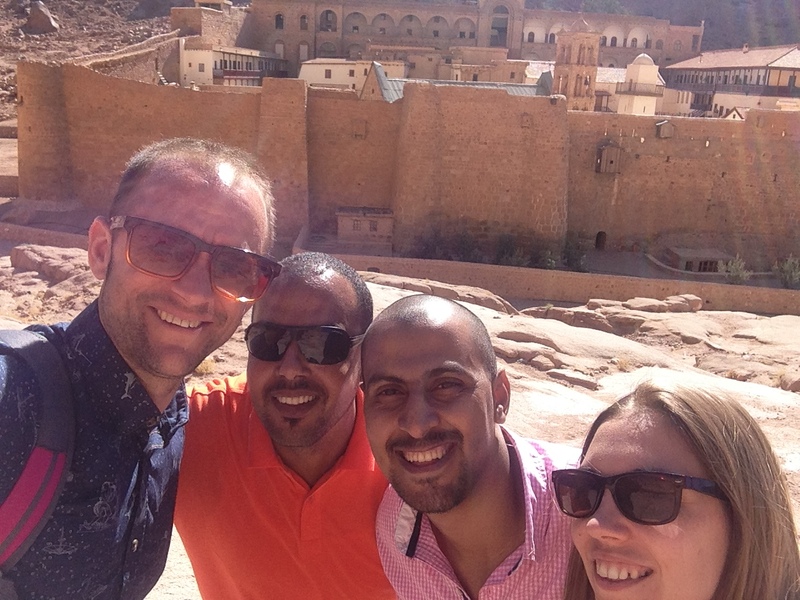 Prior to arriving at Le Meridien Dahab Resort, we booked a private taxi to collect us from the airport. This cost us $60 (about £40). Our pleasant drivers were waiting to collect us, and we found them easily, right outside the airport. They carried our bags to the car for us. The car was not quite as posh as I might have envisioned. It was a bit dirty (but let’s be honest, we are driving through deserts) but inside was perfectly comfortable, although a bottle of water would have been a nice touch.The hour or so drive flew by, due to the pleasant chit-chat with the driver and his colleague, and we were soon arriving at the gated complex of Le Meridien Dahab Resort. On arrival, we had to walk through and airport security style scanner, and our bags were checked, too. We were taken across to the check in desk, where details of the hotel facilities were explained, along with the details of what was included in the all-inclusive package. It was a few minutes past 10pm and we were starving – and it had just been explained that the restaurant closed at 10pm. I asked if there was any way of getting something to eat, and was told that room service was available (but not included). We decided to have a quick drink and retire so that we could have something to eat. 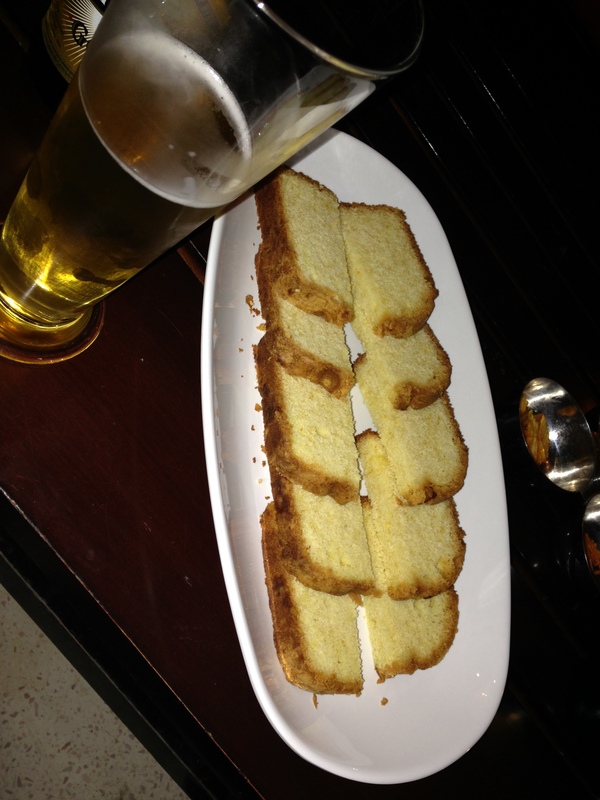 At the Omar Cafe Bar, we ordered a beer, and George, the extremely helpful barman, fetched a couple of the local beers, Sakara, and some madeira cake, as he guessed that we might be hungry. Not really the authentic Egyptian cuisine we had hoped for, but a welcome snack all the same. We head back to our room, the Deluxe Sea View, and had a read of the room service menu. It looked good. Having chosen our late night snacks, we phoned to order – only to find that our only option was a burger. We declined, and went to sleep, ready to eat in the morning. Not a great start. I had booked the Deluxe Sea View room as it was described as having direct beach front access. Sadly, I would not explain the access as direct, and it certainly was not as close to the beach as I had imagined, however, we did have a lovely view of the Red Sea, and across to Saudi Arabia. This view was enjoyed from our own terrace, which had its own wicker chairs and sun lounger. Our room was spacious enough, with both an indoor bathroom and outdoor shower – another reason I had booked the deluxe room. As usual, the bathroom was stocked a range of products, including shampoo, conditioner and shower gel. These were haphazardly replaced during the week, although when I asked for extra it was quickly received. We also had bath robes and slippers, although the slippers had a spelling mistake. Have to admire the proof reading! Our room had a mini bar and tea/coffee-making facilities. It was decorated in a terracotta colour with wooden furniture. I did find the room a little dark, and in need of a little bit of updating. Also a more thorough dusting. However, it was comfortable enough (due in part to the air conditioning) – and we spent little time in our room. 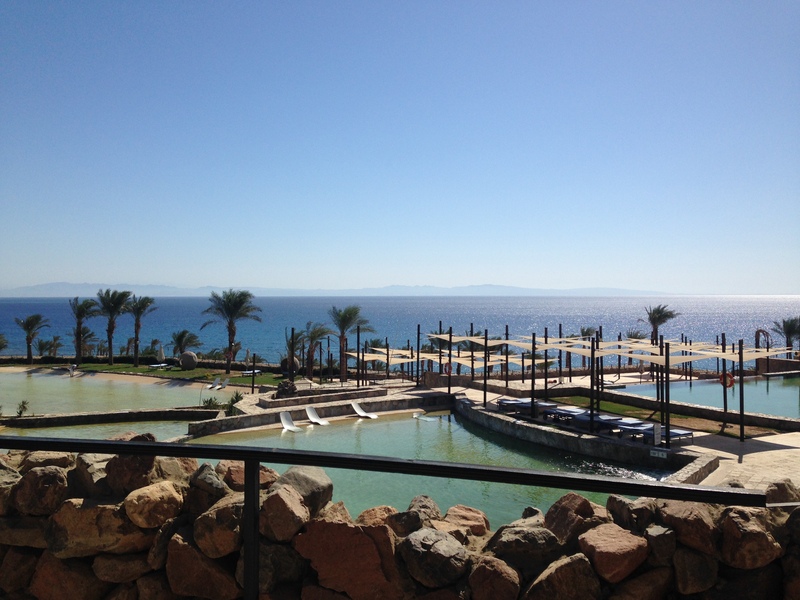 Le Meridien Dahab resort has its own private beach. The beach is not sandy, more gritty, and would not be suitable for lying in, however, sun loungers are available, and towels are provided on a card system. Sun loungers and chairs have pillows all over them, although they are quite tatty and in need of a wash. Water is fairly shallow, although the coral comes very close to the waters edge, therefore, you cannot access the sea from the beach, instead there is a pontoon which you can use to access the sea further out. You will be told off if you swim back across the coral – its good to see a hotel taking care of the natural habitat! Darren spent hours in the water – which left me to a enjoy a few good books! On the beach front, ‘Sails’ restaurant had a good supply of water, soft drinks and beers, although I chose to drink mine from the original bottles as the plastic cups used were quite grubby. The restaurant was not serving food whilst we were staying, I assume due to the low occupancy, which was a shame as the menu did look good, and would have been a welcome change for lunch. At 4pm each day, the staff rallied up the guests for a game of volleyball. 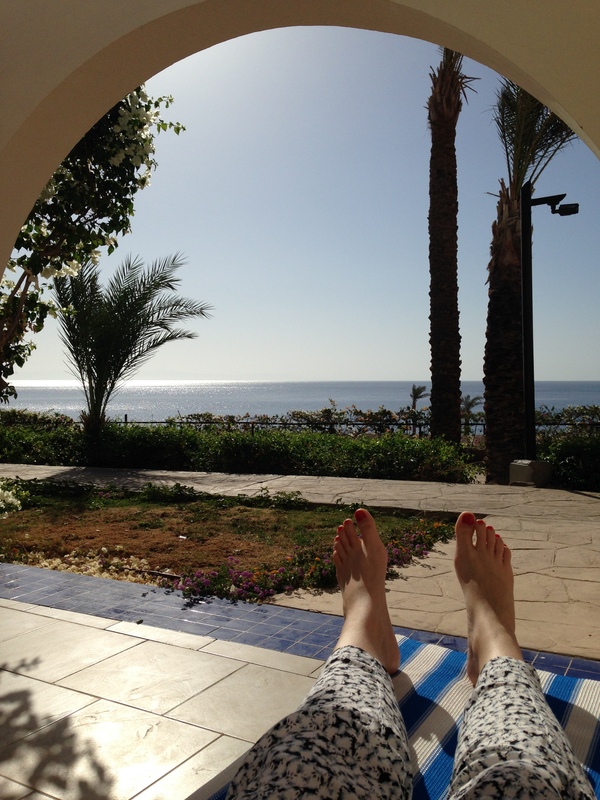 The spa was closed whilst we were at Le Meridien Dahab Resort. There was a masseur working on the beach front, who sadly could not take ‘no’ for an answer and constantly hassled us about having a treatment. In the end, I found I myself being very rude and turning my back so that he would go away. There are a number of pools on the resort, again, with plenty of sun loungers available to use, although we only spent one afternoon by the pool, and never went in. Darren and I made use off the small gym each evening. We had a perfect view of the sun setting over Saudi Arabia whilst we worked up an appetite for dinner. There were about 10 machines in the gym (all of which were in working order), and two shower/changing rooms. We were joined by other guests each day, so I would expect it to be quite busy when the hotel has a higher occupancy. 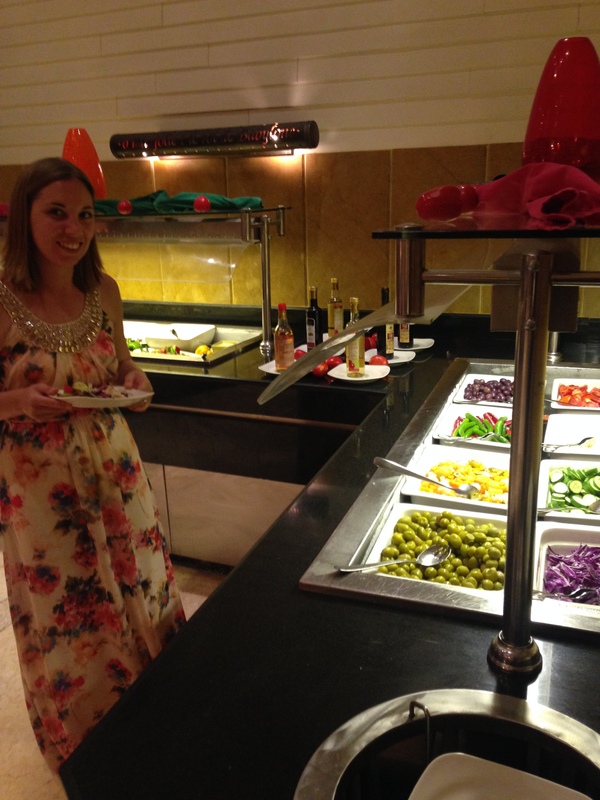 Le Meridien Dahab Resort has a number of restaurants. For the most part of our holiday, we ate at Vie Restaurant, where there was a small buffet at breakfast, a salad cart and hot meal for lunch, and 4 course a la carte meal in the evening. Variety was limited. One evening there was a BBQ with a much greater selection of foods. For the last couple of days, dining was moved to the Sea Breeze Restaurant for breakfast and dinner. Variety increased dramatically. As I mentioned earlier, Sails is located on the beachfront, and Omar cafe is located in the lobby (where you will find free wi-fi although there is not enough signal to connect for the smallest of tasks). There is also a shisha terrace and cocktail bar, Horizons, although this was not open during our stay. All inclusive at Le Meridien Dahab Resort included Breakfast, Lunch, Dinner, with tea, coffee, soft drinks and locally produced alcohol. The local wine was terrible – imported bottles cost from £25 each. A full review of our dining experience can be read on my earlier blog post. At the time of our visit, Egypt is experiencing political unrest, and visitor number have dropped. 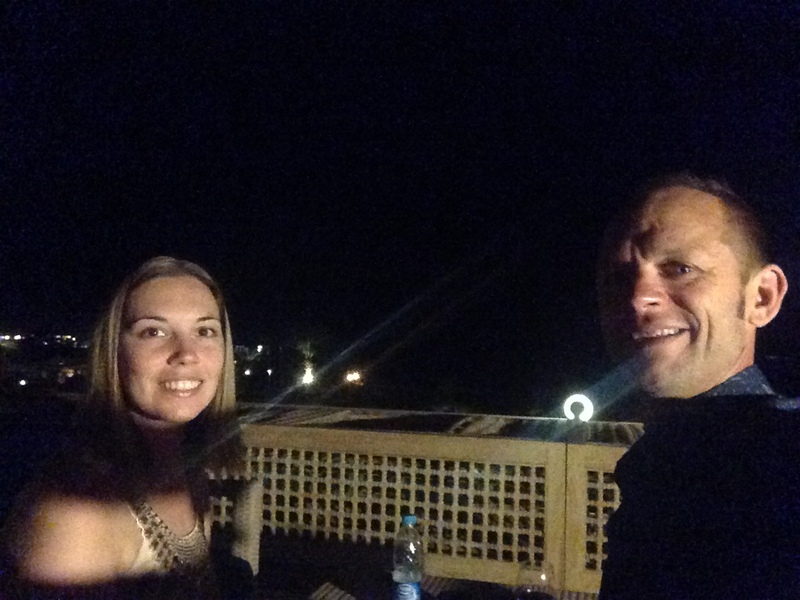 Indeed, when we arrived at Le Meridien Dahab Resort, we were two of only 15 guests at the hotel. This can in some way explain the limited variety of food for our stay, however, I would have much preferred a better quality and smaller meal. Had we have been able to order and pay for meals from a separate menu, we would have done so. As seasoned travellers, we found it difficult to stay in the resort as intended. 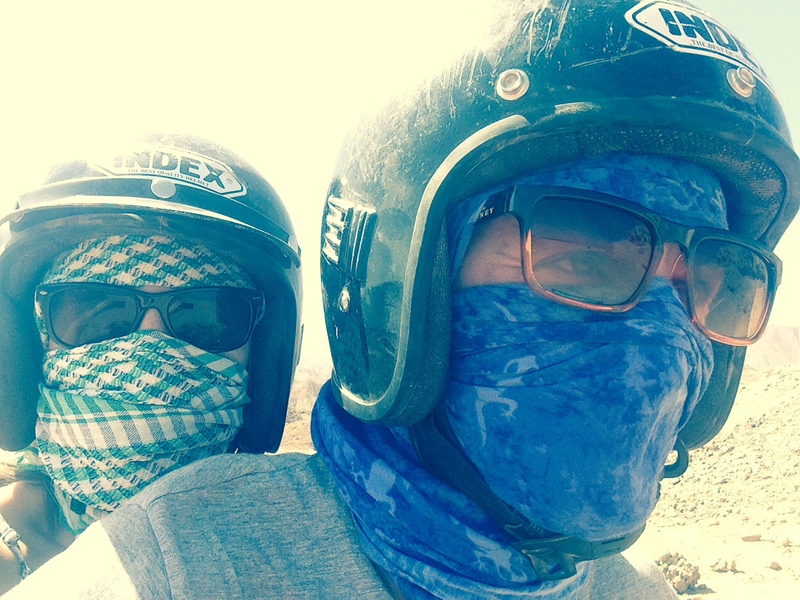 We booked a quad biking trip through the ‘desert’ to the Blue Hole through the hotel, which, whilst disappointingly did not take us into the desert, did take our breath away when we entered the blue hole. Having booked an equally unimpressive fishing trip during our stay at The Sheraton Pattaya Resort, Darren agreed that hotel tours are a waste of time, and, wanting to return to the Blue Hole, we asked the drivers who picked us up from the airport, if they would be happy to be our drivers for the day. They agreed, and we spent a lovely, relaxing day at the Blue Hole, with no time restraints, and the ability to eat and drink where we pleased. Much more our thing. We also arranged a trip to Mount Sinai, where Moses is said to have received the 10 commandments. 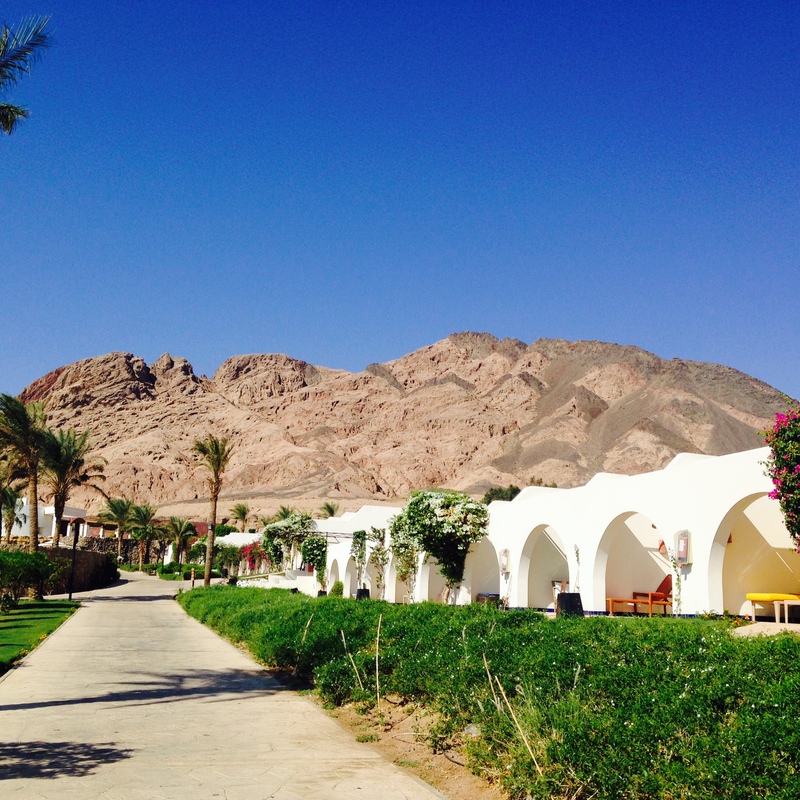 Our stay at Le Meridien Dahab Resort was by no means a 5 star experience. Although staff were friendly, general customer service skills were lacking. Food quality was poor, and despite listings on menus, many item were unavailable. On a few occasions, we received tea pots with broken spouts. Certainly not expected at a 5 star resort. The hotel itself is set in a beautiful location, however, it does need a good renovation to really be able to live up to its 5 star rating. 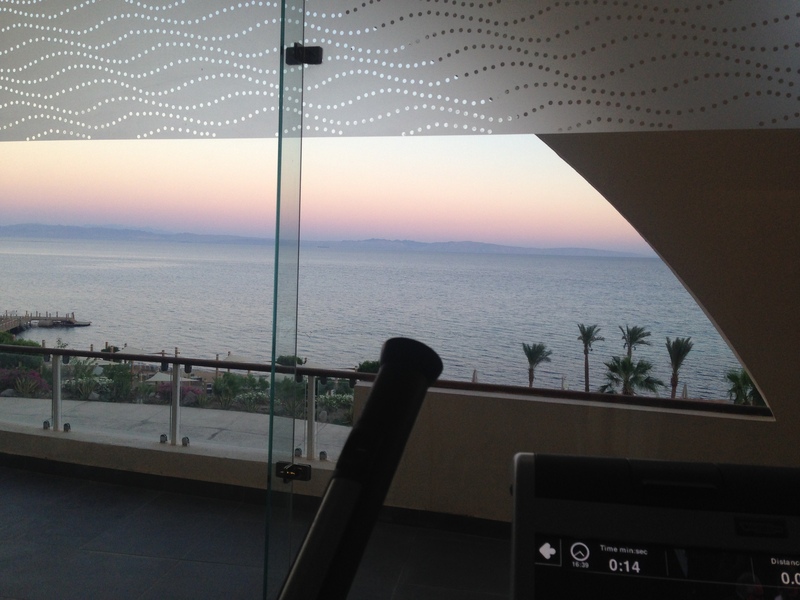 It cost $160 per night to stay at Le Meridien Dahab Resort, which included the all-inclusive package. The rack rate for this hotel is $150 dollars for the deluxe sea view room and stays in the other rooms are $120 (superior) or $250 (suite). We would love to return to Egypt – we didn’t get the chance to dive due to my bad back, so this is still on my bucket list. We would stay at Le Meridien again, but would go with much lower expectations that on this trip. The stay fulfilled its purpose. We had a good rest, read a few books, saw some amazing sites underwater, were never hungry, or thirsty, and, we couldn’t look at ‘work stuff’ because the internet was so poor. We had to switch off for a few days. And this was what we needed!